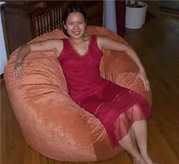 Ahh...That bean bag is just right! 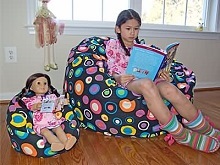 These 27 inch wide bean bag chairs are perfect for young children, like toddlers. 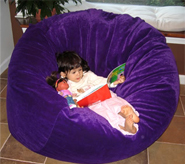 They can be easily pulled from room to room, wherever your little one decides he needs to sit. We all like to call something our own, right? So does your child! 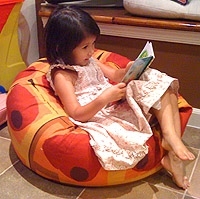 Small size bean bags can also be great for smaller pets, or even to put your feet on while you are sitting on a larger bean bag. 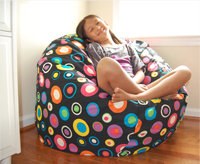 And, in a pinch, they make super spur-of-the-moment seating that you can hide in the closet when not in use. Or simply stack them! 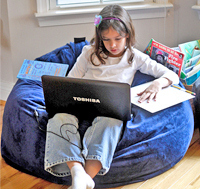 If the 27 inch small size is too small, but you just don't have the space for 37 inch bean bag chairs, then the 32 inch size might be just right. We suggest these sizes for people less than 5 feet, especially if you don't have room for larger chairs. However, if you have the room, a longer-term value would be the 37 inch size, which suits most kids and adults. This is the size that most people get for kids and adults. 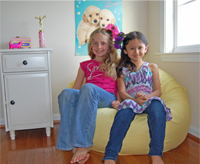 About 90% of our bean bags sold are in the 37" premium size. It's about 3 feet wide, which suits most people. 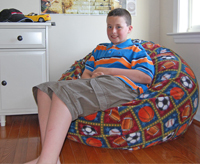 If you are larger or want a super-roomy bean bag chair or want a couple kids to be able to share, you may want to check out our 52 inch giant size. 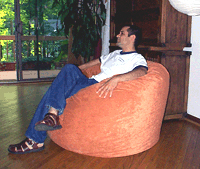 The 52 inch wide bean bag chairs are our largest size, over 4 feet wide. They are great for adults and teenagers. 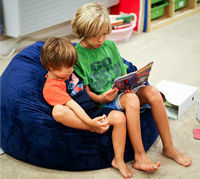 Our giant bean bags are also perfect if you want a couple kids to share. Each one comes with a super large cover that is washable in your household machine, an inner liner that resists liquids, and of course filling. Compare the 37" and 52"
37" large partially fills 4x4 foot space. 52" giant completely fills 4x4 foot space. 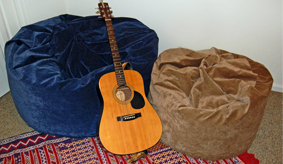 52" and 37" compared to guitar.